The days are getting shorter and the nights are a little cooler, which can only mean one thing: it’s officially time to start devising the trials you’ll put the neighborhood children through this Halloween. For [Randall Hendricks], that means building a new candy dispensing machine to make sure the kids have to work for their sugary reward. After all, where’s the challenge in just walking up and taking some candy from a bowl? These kids need to build character. [Randall] writes in to share his early work on this year’s candy contraption which he’s based on a popular arcade game called “Goal Line Rush”. In this skill based game a disc with various prizes spins slowly inside the machine, and the player has a button that will extend an arm from the rear of the disc. The trick is getting the timing right to push the prize off the disc and into the chute. Replace the prizes with some empty calorie balls of high fructose corn syrup, and you get the idea. There’s still plenty of time before All Hallows’ Eve, so the machine is understandably still a bit rough. He hasn’t started the enclosure yet, and at this point is still finalizing the mechanics. 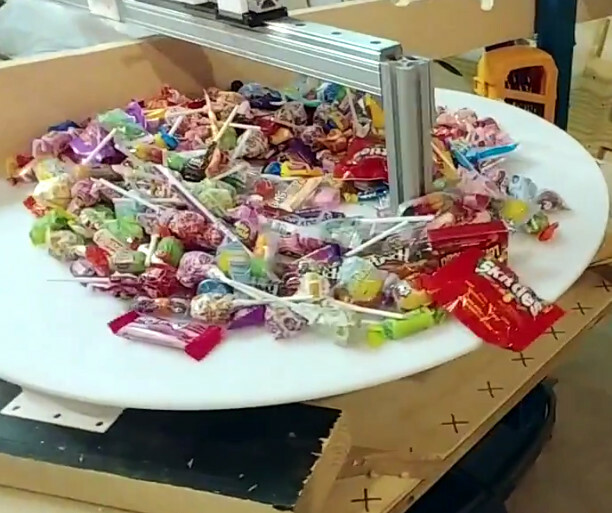 But this early peek looks very promising, and in the video after the break you can see how the machine doles out the goodies. The disc is rotated by a high torque motor, and the aluminum extrusion arm is actuated with a gear motor and custom chain drive. Some 3D printed hardware, a couple limit switches, and a pair of relays make for a fairly straightforward way of pushing the rod out when the player presses the button on the front of the cabinet. Considering how his previous Mario-themed candy dispenser came out, we doubt this new machine will fail to impress come October. The neighborhood kids should just count themselves lucky he’s not using his creativity to terrorize them instead. Coin pusher scam to the next level :) love it. There’s a very similar game called Tower of Tickets that is the same concept, used to work for the company that made that one.